Hello, I'm CGM. A handful of you may know me from other forums. I'm a long term fan of RCTs 1&2 and have also dabbled in NoLimits. 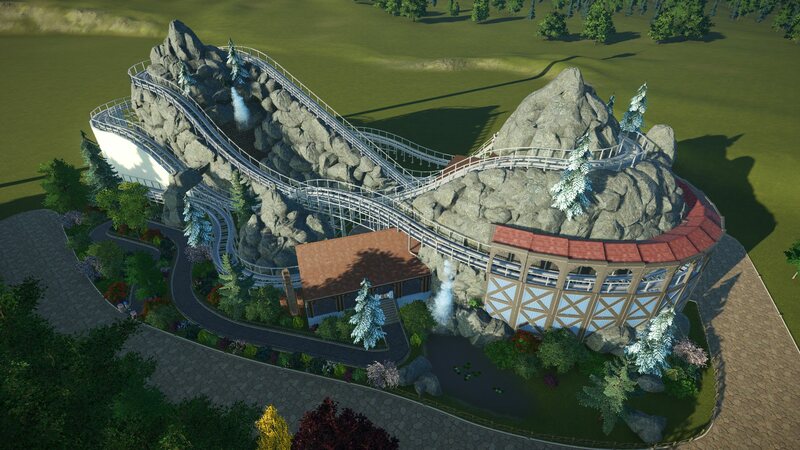 While I have been impressed by others' creations, I could never really get along with RCT3. 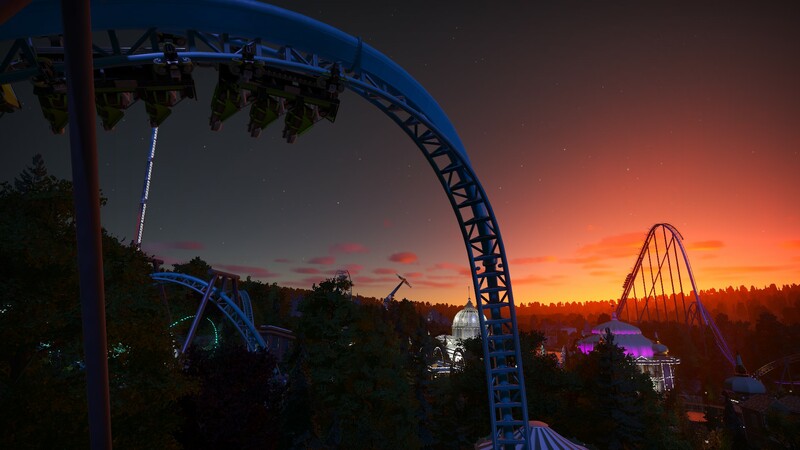 However, I got Planet Coaster a few weeks ago and I'm hooked. 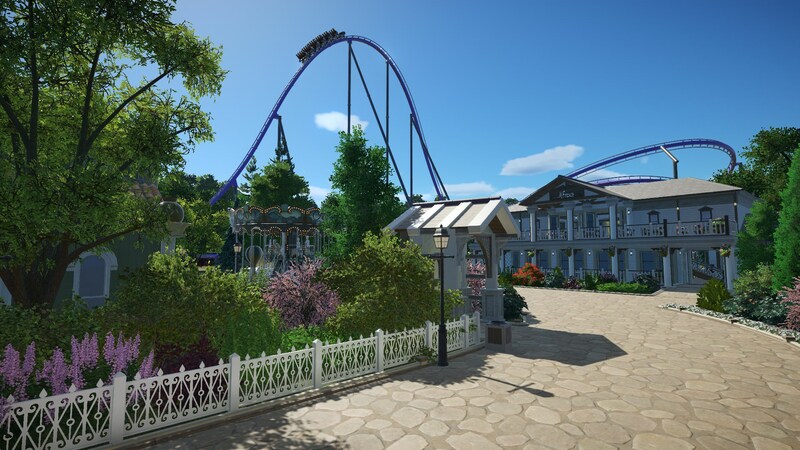 This is my first park in Planet Coaster: Hazelwood Gardens. 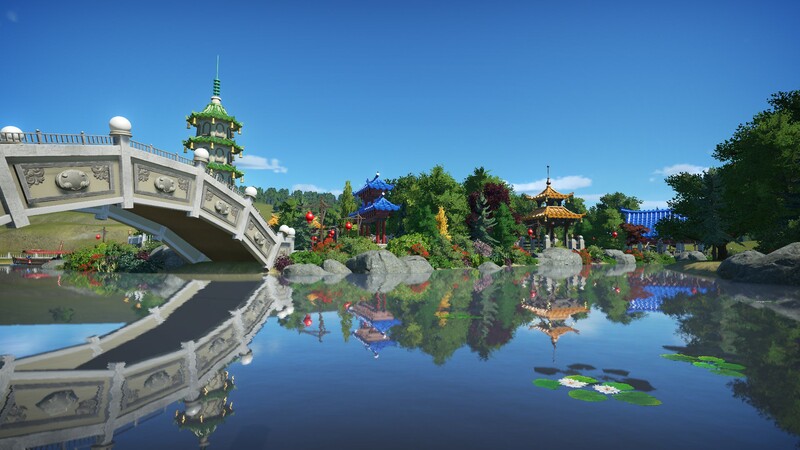 As it is my first park, it's a bit of a learning experience for me, particularly with the scenery and building tools. I'd like to think that I'm continuing to improve with each new structure. The park is loosely based on this picture I drew of a hillside amusement park. It takes inspiration from a number of places from within the theme park industry as well as outside it. 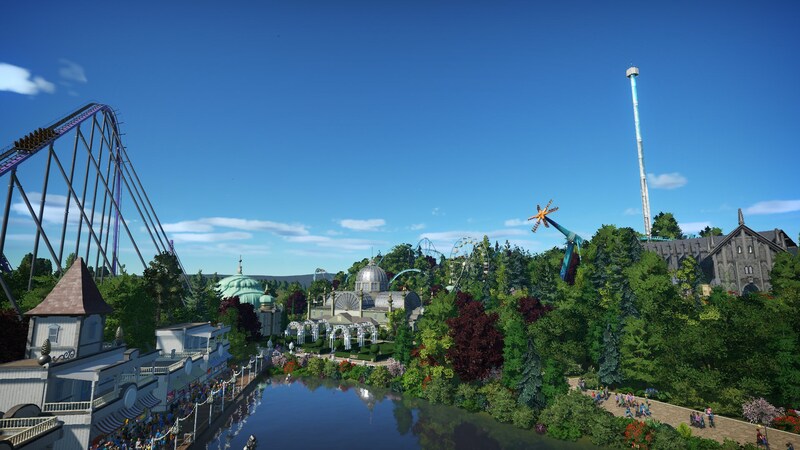 The biggest and most obvious influences are probably Liseberg and Tivoli. 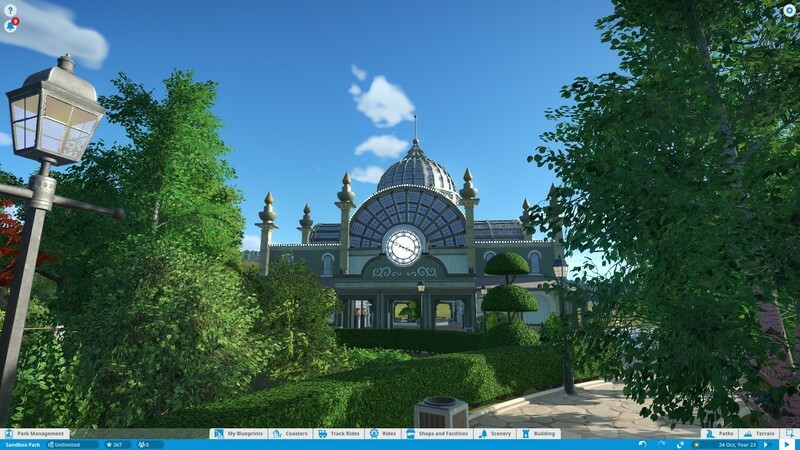 I wanted to create a park that looks and feels like it's been there since the turn of the 20th century and that has retained its period features while still being a modern park. This is the entrance building. It's the first building I made in PC so it's a little low key. If I were to make it again now, it would probably be a bit more elaborate. I currently have no plans to replace it though. The only coaster currently in the park is a B&M hyper. It swoops over the entrance much like Fury 325. An overview of the entrance plaza. This is The Pavilion. 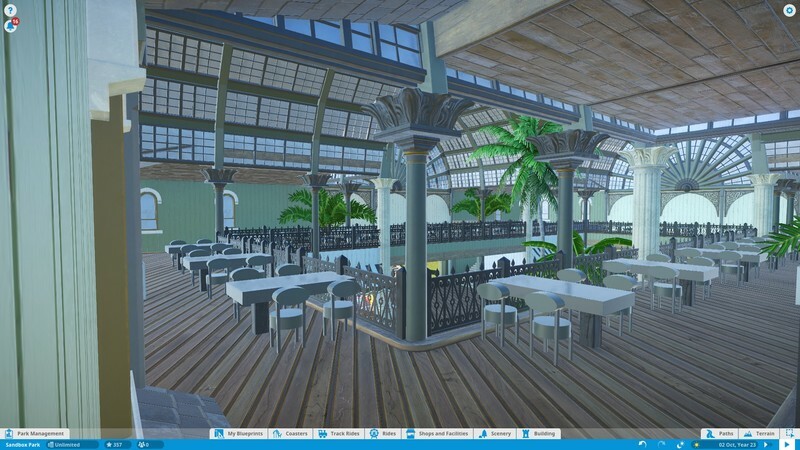 Originally, it was intended to be the park's main food and drink hub but it was quickly replaced in that role. It now acts as the guest services building. To the right of the entrance stands the Hazelwood Theatre, the park's main entertainment venue. The theatre interior. To accommodate it within the building, it was sunk into the ground. The dress circle is accessed through the main entrance. Access to the lower level is round the sides of the building. The stage under the lights. A key feature of my original drawing is the funicular railway to transport guests up and down the hill. Obviously, this isn't available in the game so I built a static one from scenery objects. Once constructed, the Grand Arcade became the park's new main food and drink venue. Seating on the upper level. The Ferris Wheel is perched on the hill above the arcade. The entrance plaza at night. An overview of the progress so far.Thanks for reading/viewing! You've just put most of us to shame with your "first project". This is simply gorgeous. Those interiors are so spectacular. The arcade and the theatre...WOW! 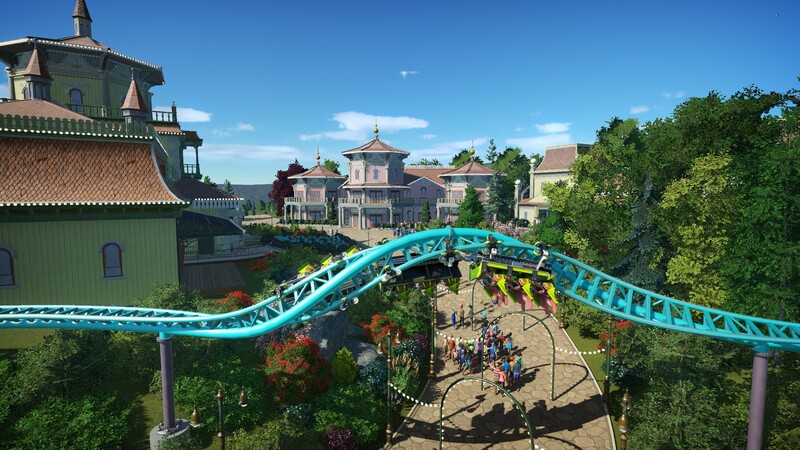 And I thought that initial drawing was a Photoshopped screenshot of a Planet Coaster park, not an original drawing. 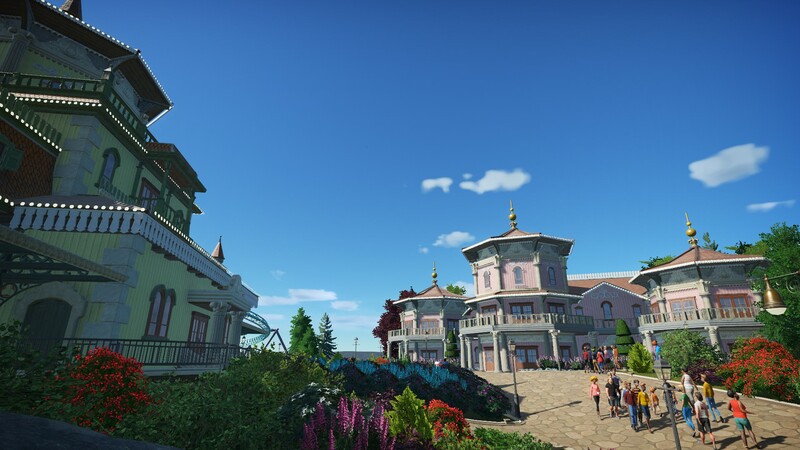 Welcome to SGW and I hope you stay for a long time. 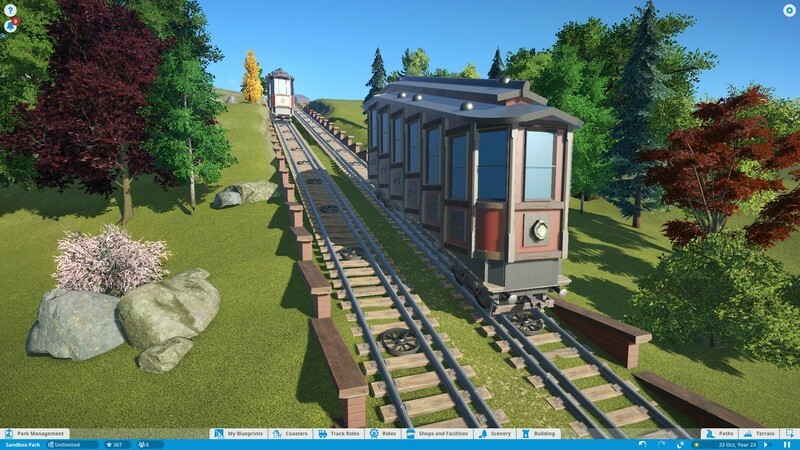 That Funicular railway is just wow, I wish they had it in game so I could watch it go all day. For some of your first work its super impressive! Looking forward to seeing more! Proud Member of: Dutcher's Outer Worldly Network, fun for all and all for fun! 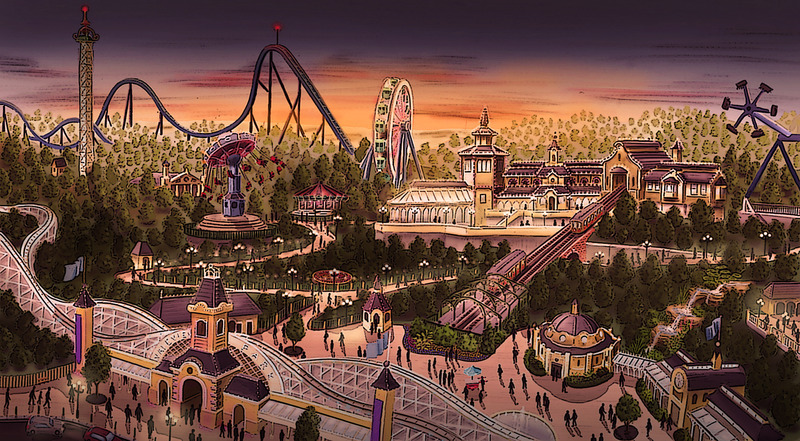 WOW that is an amazing drawing, but your park is even better the interior of the theater is amazing. 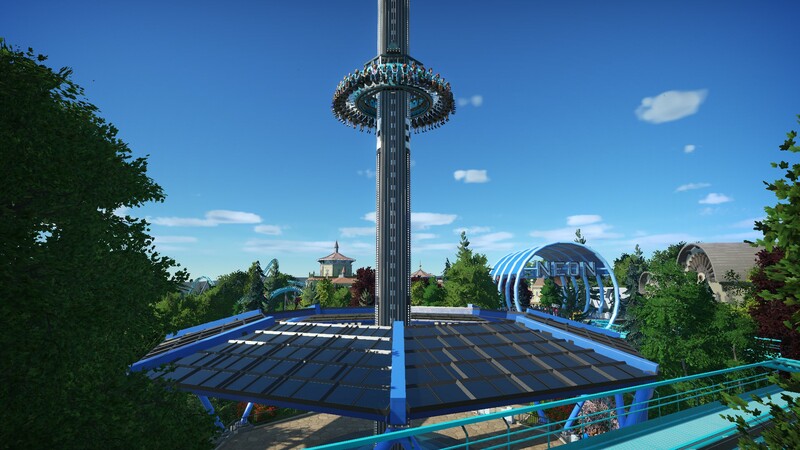 now all your park needs is a classic woodie!! This park is so beautiful. Your architecture is sublime. Wow, if that's your 1st effort, I can't even imagine what you'll be making once you know what you're doing . That is just incredible! So beautiful, so detailed. AND you can draw, TOO?!?!?!?! You are definitely a multi-talented artist! 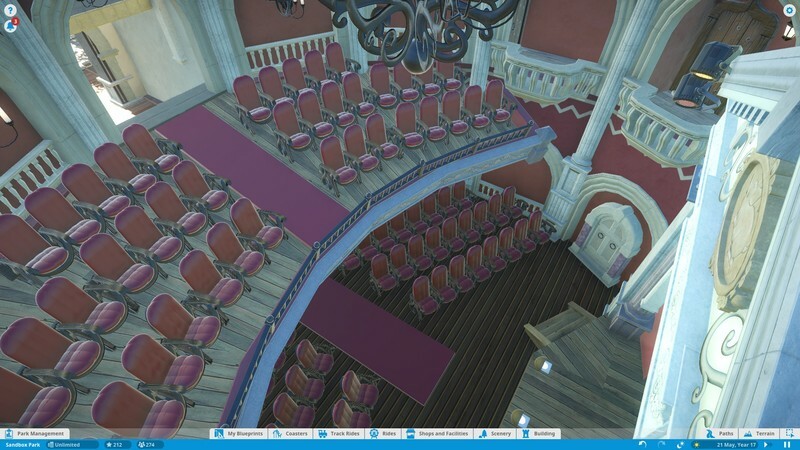 Very creative use of some of the objects, I love the theater, it looks a bit small and I don't think the views on the balcony are that great, but it looks very good. 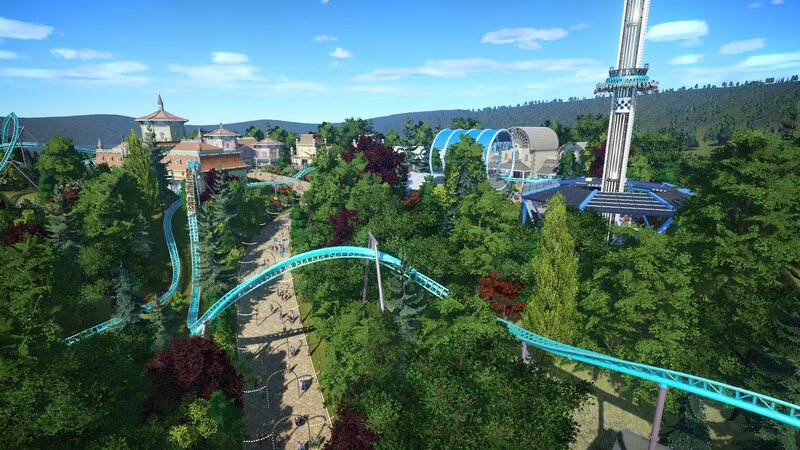 Your first park?! Are you kidding me? That theater is amazing! So is that train thingy and so are your buildings! Thanks for sharing this with us! Welcome to these wonderful forums. And WOW! Where did this come from? This is so impressive. So many lovely details. And I love your artwork too. This park is definitely one to watch. WOw this stunning! 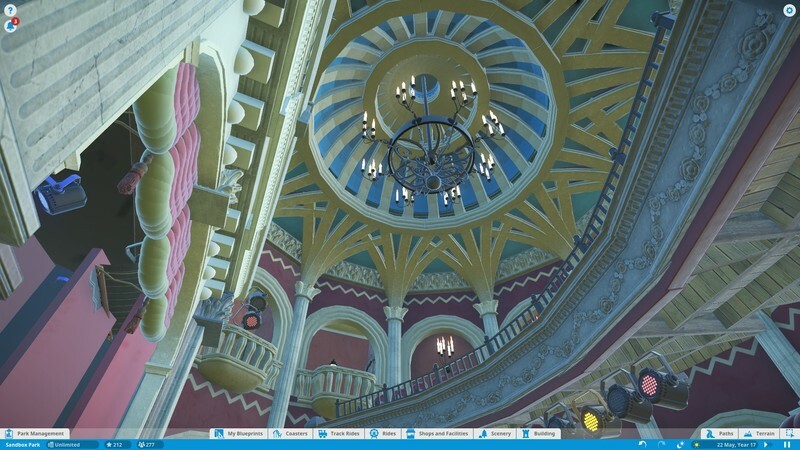 The architecture is just jaw dropping particularly the interiors! So much detail has done into it! 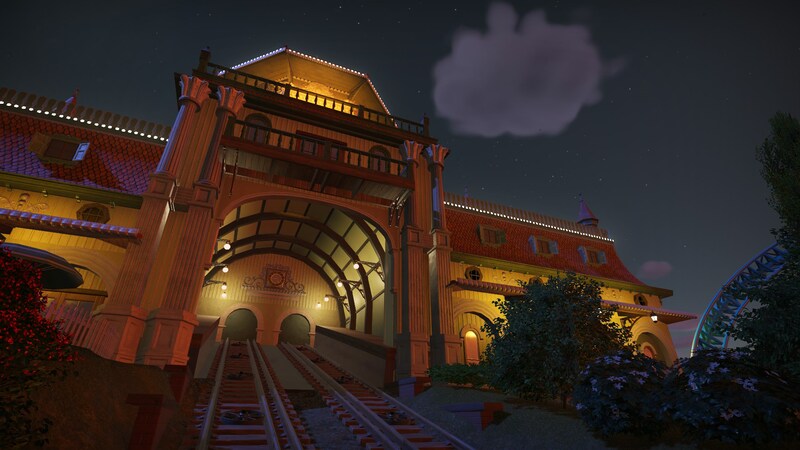 That railway is one of the best things I've seen in Planet Coaster. 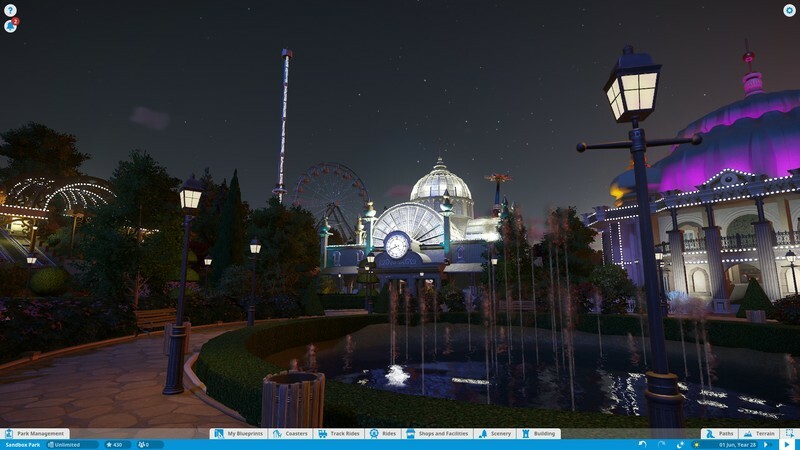 I was convinced it was an in game ride and not scenery! 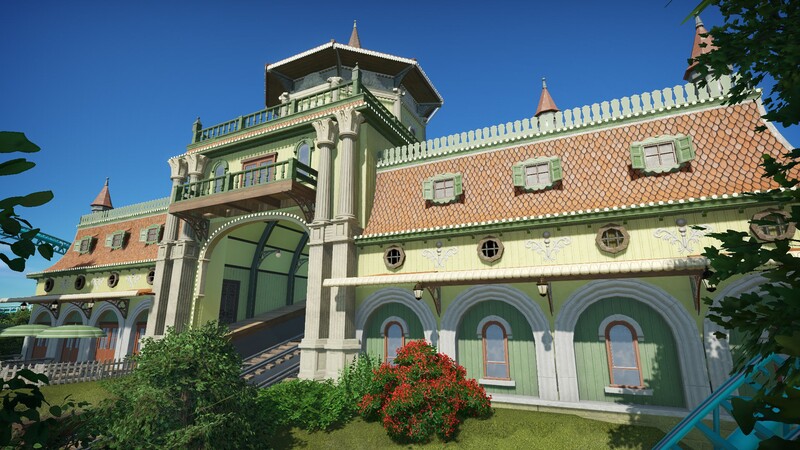 Planet Coaster Blueprint Essentials - Don't start a new project without these! 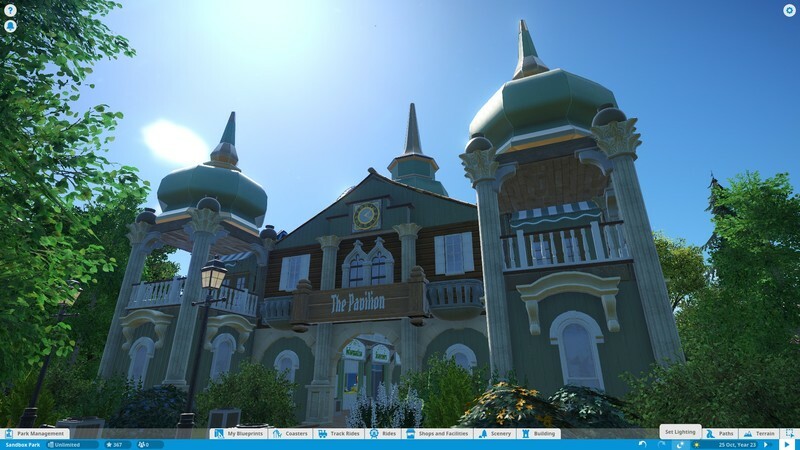 Check out this awesome project by a member of the SGW community! How have I not seen this?!? This is spectacular, the drawing rendering the thought, imagination, placement and detail. I could write a 10 page essay about it! You got your self a fan! I do love the creativity with the railway! 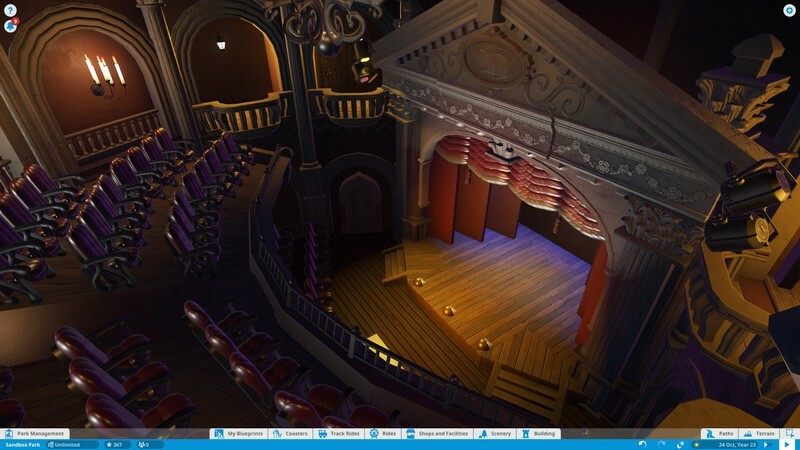 The theater and other interiors are beyond words! Anxiously waiting for a update! Wagibear "It is entirely possible that Atari will attend in a different way than as a exhibitor. Someone may park their van outside the Convention Center entrance with a big Atari RCTw banner draped in the front window. Or maybe Mattlab will dress in a trenchcoat and approuch anyone with a PRESS badge and whisper "Psst! Hey, wanna see a new video game?"... " Oh my god, that theater interior is absolutely insane. The scale, the seats, the ceiling!!! Those interiors are PHENOMENAL! Some of the best I've seen. This park is so grand--it's beautiful! 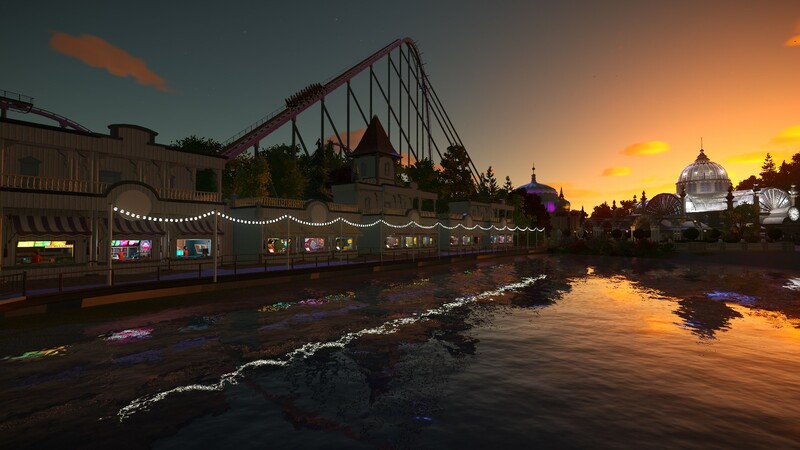 A warm welcome to SGW! I like the idea to seek inspiration by that first picture. 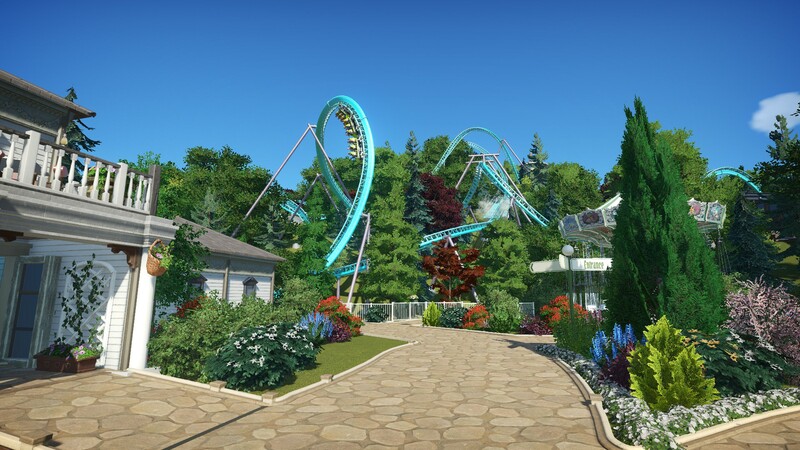 You transport the special atmosphere and vibe in your park in a great way. 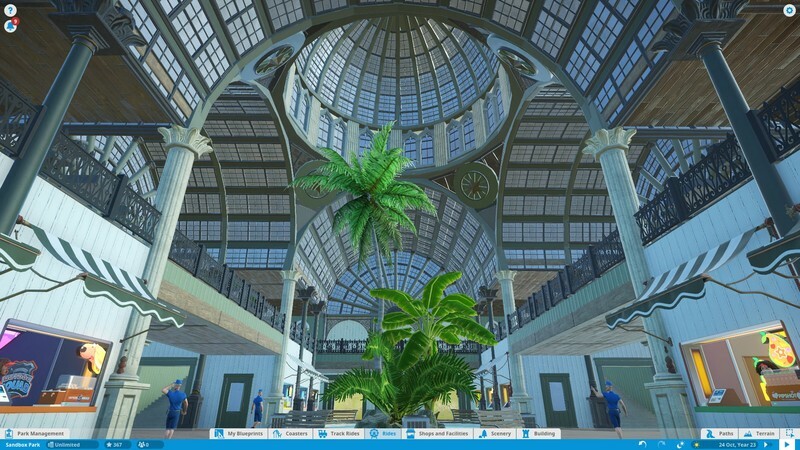 You are able to create stunning structures such as the Grand arcade. It looks superb! Most of all I am in love with the interior of the theater. What a fantastic indoor scene is that? It´s perfectly executed. Well done! WOW! This is just amazing! 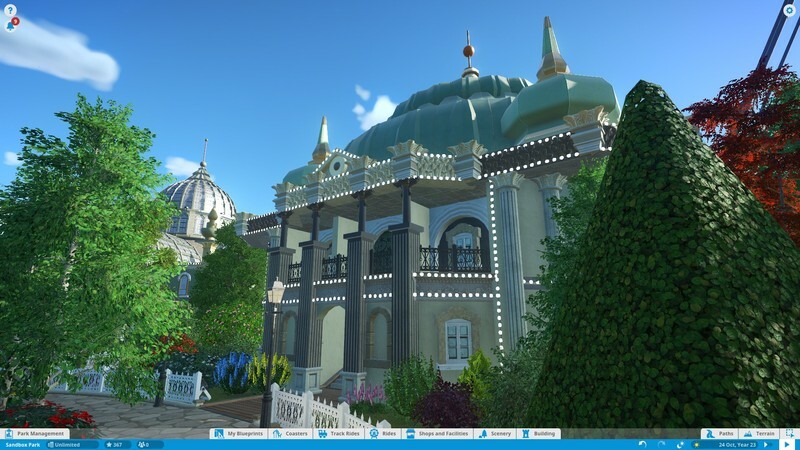 The detail on those domes and arches!! Everything looks amazing. I can't wait to see more!! Nice one! 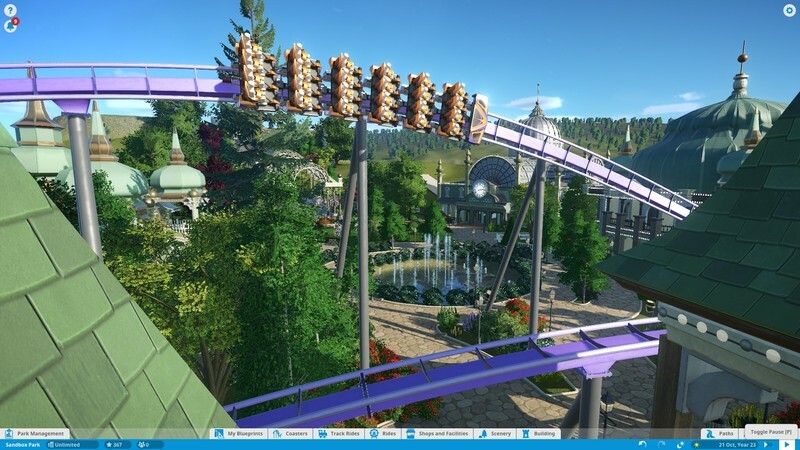 Keep us updated with another bunch of awesome screens! Streamer and Youtuber from switzerland! 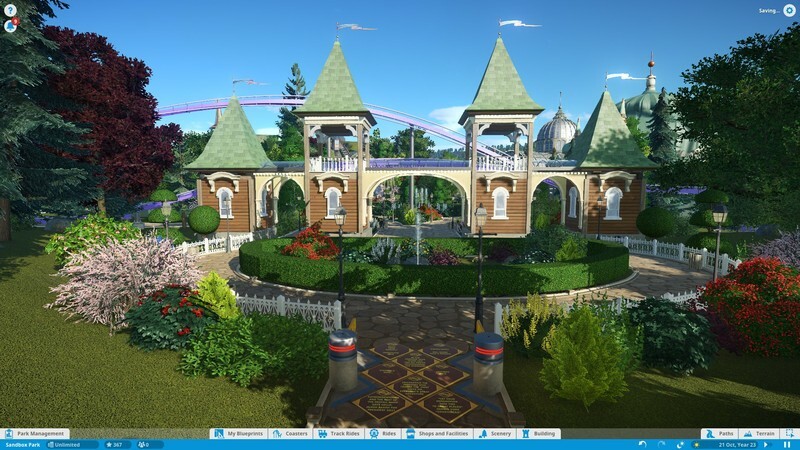 Hello everyone, one year later I'm back with a second update of Hazelwood Gardens. I should probably apologise for the delay. 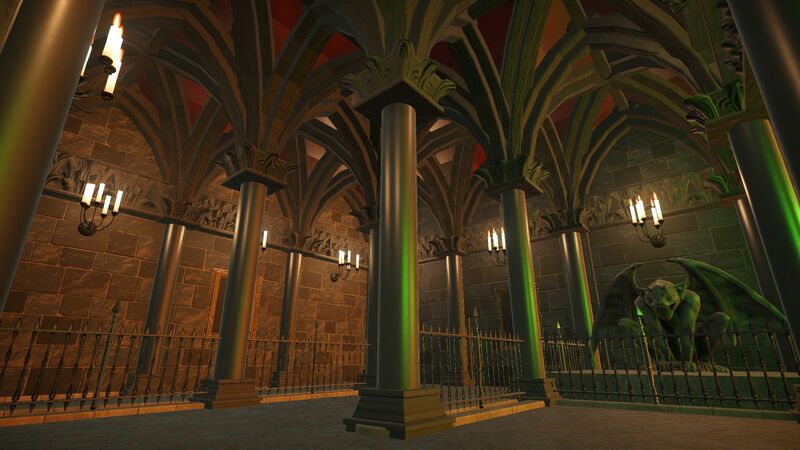 The work featured in the first update came out of about 3 weeks of intense building and shortly afterwards, it began to feel like a bit of a chore. I worked on it in dribs and drabs over the last year making very little progress. Recently though, with the advent of the vintage pack, I decided to give the game another proper go and have been enjoying it a lot more. I think generally, the park is nearing completion. I want to keep the park feeling quite small and cosy. 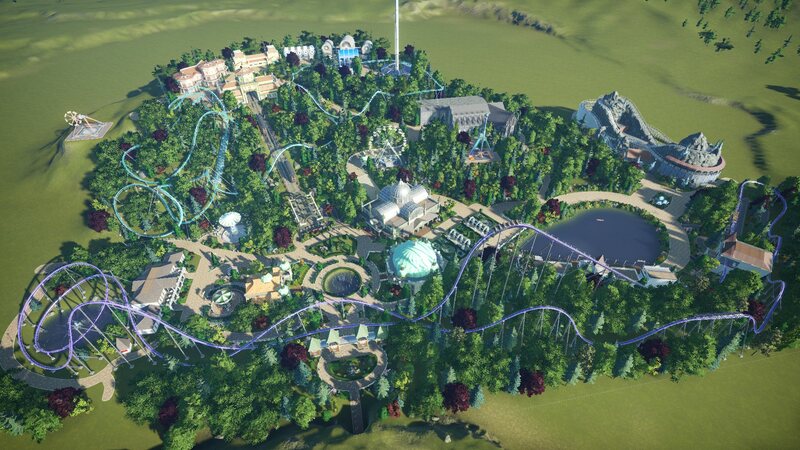 I'd also like to move onto other parks at some point but I'm determined to complete this project first. Welcome back to Hazelwood Gardens! Looking across the lake at sunrise. 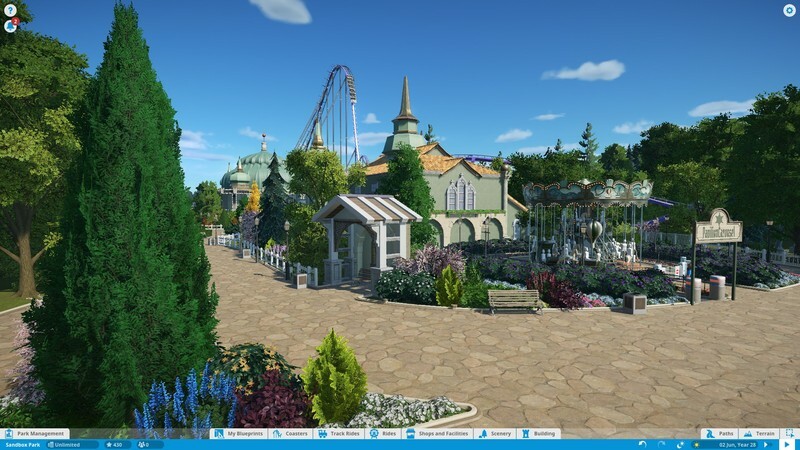 To the left, you can see the park's new boardwalk area featuring a wide range of shops. An Italian restaurant has been built near the B&M hyper's turnaround. Outside the Grand Arcade, there is a formal garden overlooking the lake. Up on the hill is Crow Hall, the park's dark ride. 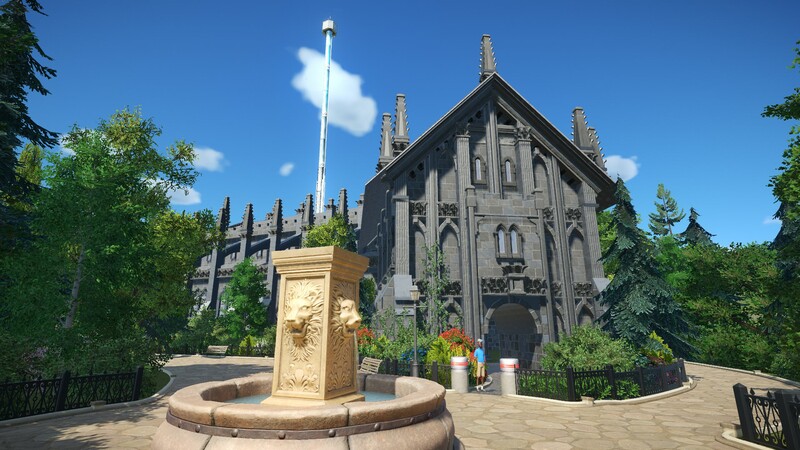 A lot of parallel Gothic influence went into the ride's facade. Cross vaulting in the Crow Hall queue line. The ride itself is yet to receive its theming. 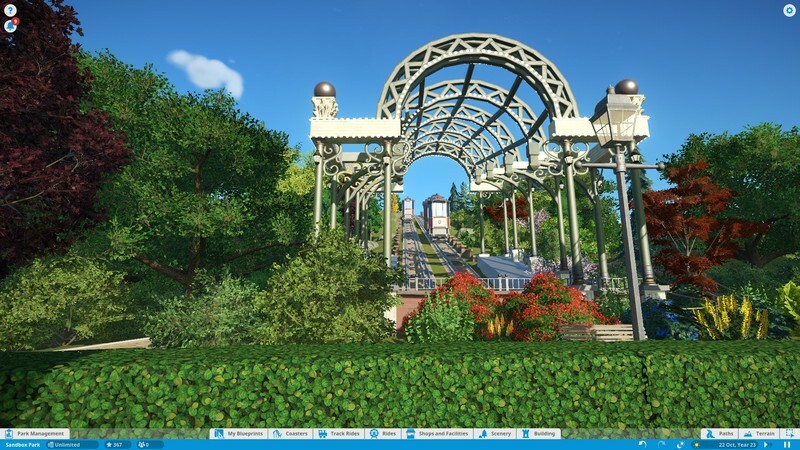 A Scenic Railway heavily inspired by Tivoli's version. 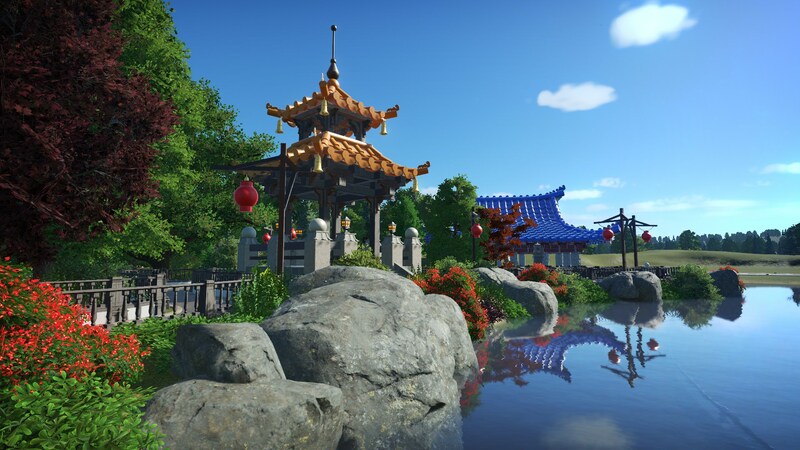 I know that many people have done much more elaborate things with rocks in Planet Coaster but even so, I found positioning them extremely tedious. I don't know how people have the patience to build entire mountains using these things. This coaster dates back to the early days of the park in the 1910s. The funicular railway has recieved a new station at the top of the hill. The building is shared by a ballroom and event space (these are imaginary unfortunately). A shot showing the station's interior. Also new to the park is Neon, an LSM launch coaster that twists its way across the hillside. (No points for guessing which coaster inspired this). Finally, here are a few shots from around the park. Thank you for reading this update. I hope you enjoyed it and I hope it won't be another year before the next! I like the colors. Your buildings are detailed and I really want to see more from this. Please do not make us wait another year! 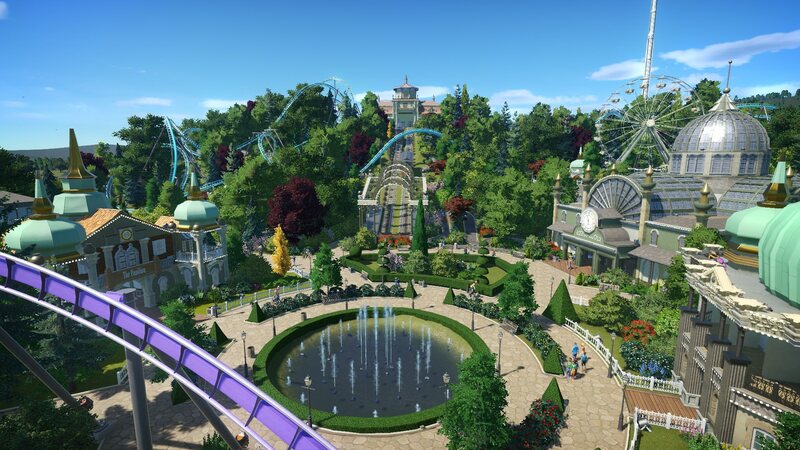 Wow - this is a great park and nice work on everything. 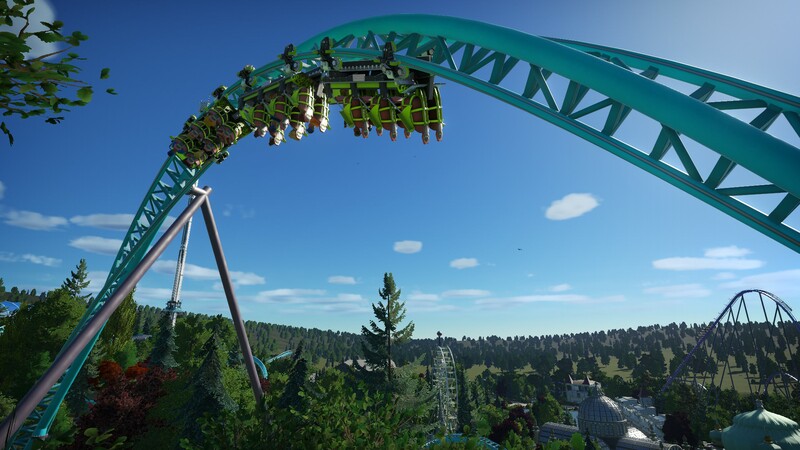 The Mountain coaster is very unique and well done. 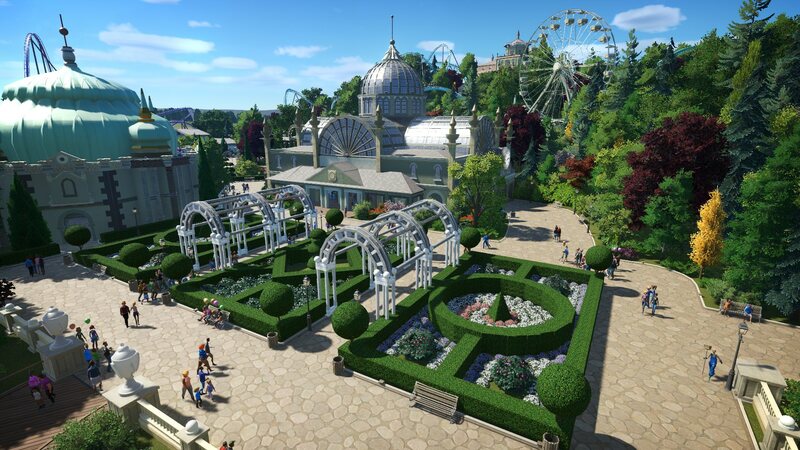 I also love all the formal gardens and the especially the mountain tram. 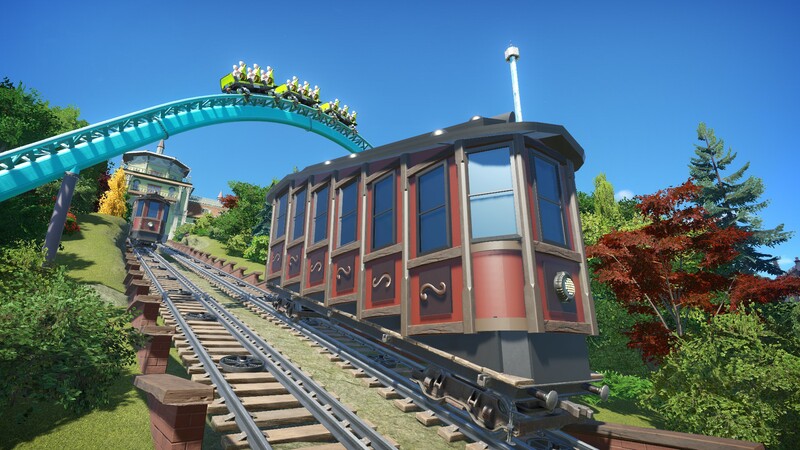 To bad that not a real working ride in the game. A bit over a year ago, I was totally impressed and wondered what you'd be doing in the future. Now I know. And I was right, you've gone from strength to strength and have totally outdone what you had originally. This is all fantastic, the detail and functionality all so beautifully executed. WOW, this is top-shelf stuff. WOW! 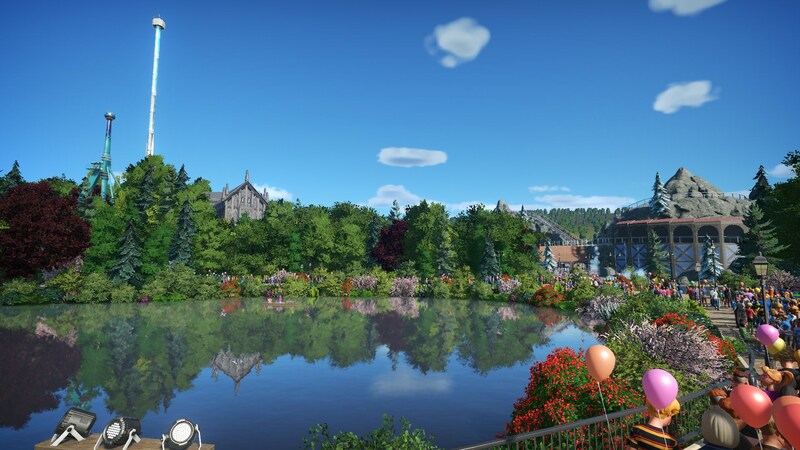 This is truly one of the most beautiful parks I've seen in this or any other game. So gorgeous! I keep staring at the Gothic dark ride. So foreboding! Well this is exciting. Terrain parks are always a struggle but can prove to be very impressive and iconic. Creating a focal point with the funicular and hilltop buildings really draws attention to the hillside and creates a statement of grandeur. 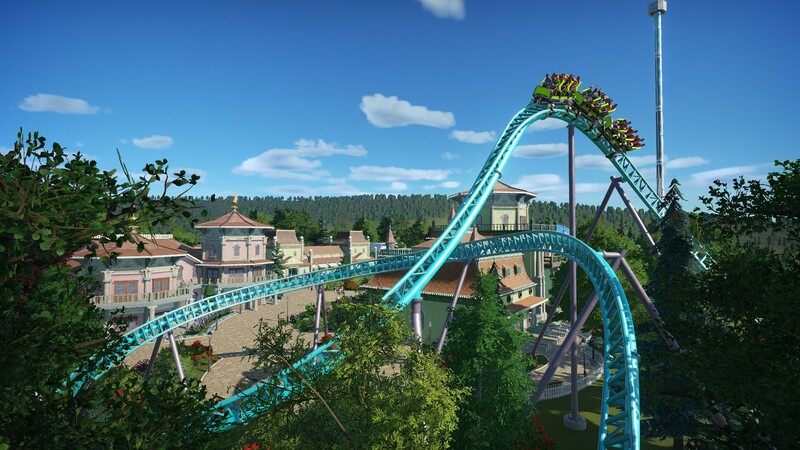 My only issue is that the blue coasters layout is a little messy and the color seems to clash a lot. 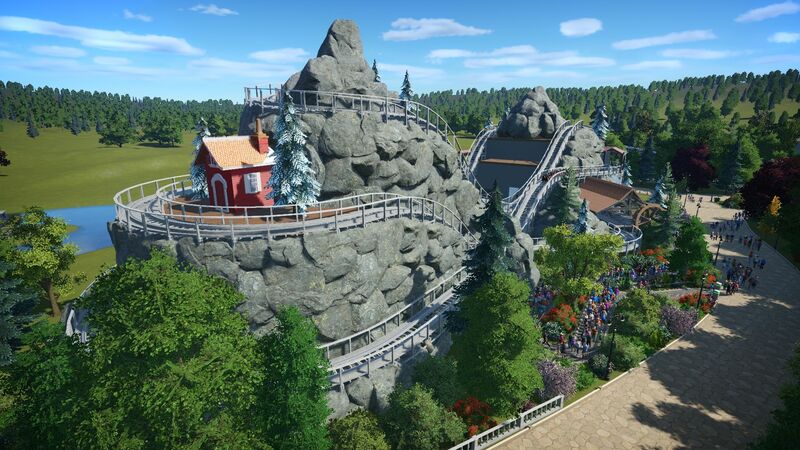 Creating a few grander gestures that peak above the treeline and keeping the rest of the ride against the hillside will really improve its appearance from far away. I only point it out because im in love with the hillside and the almost forced perspective you have going on. 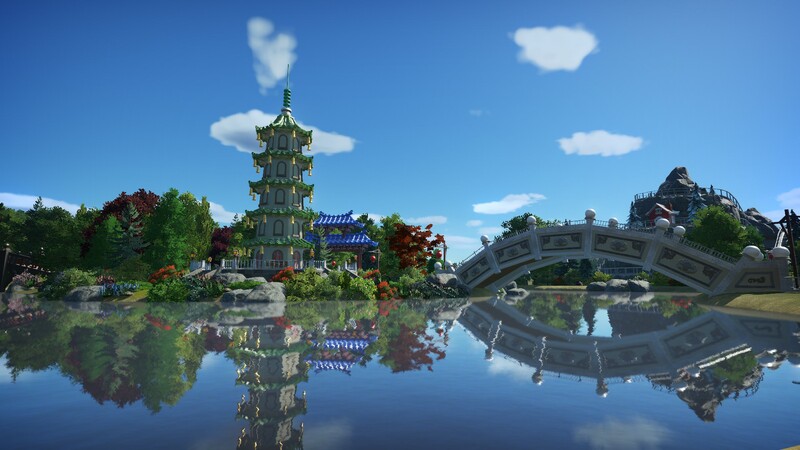 Hello everyone, this update introduces a Chinese water garden to the park which I have named Pagoda Island. 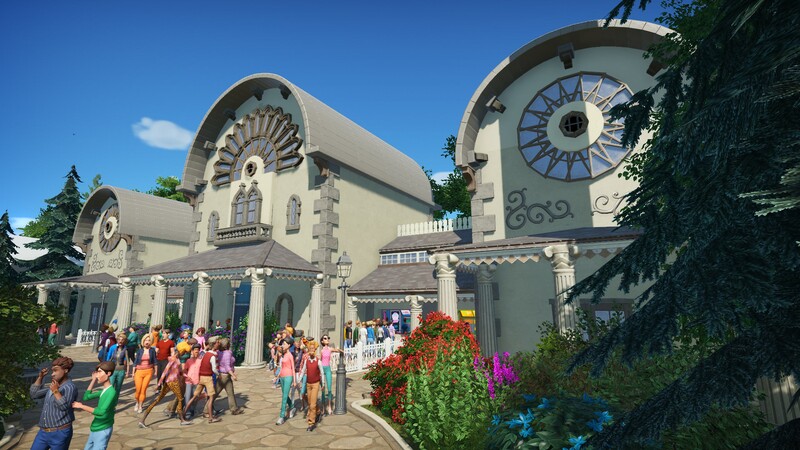 This draws inspiration partially from Tivoli which has a beautiful south-east Asian area which blends seamlessly with the rest of the historic park. I have also been lucky enough to have visited Mainland China and Hong Kong a few times which is where I drew most of my architectural inspiration from. 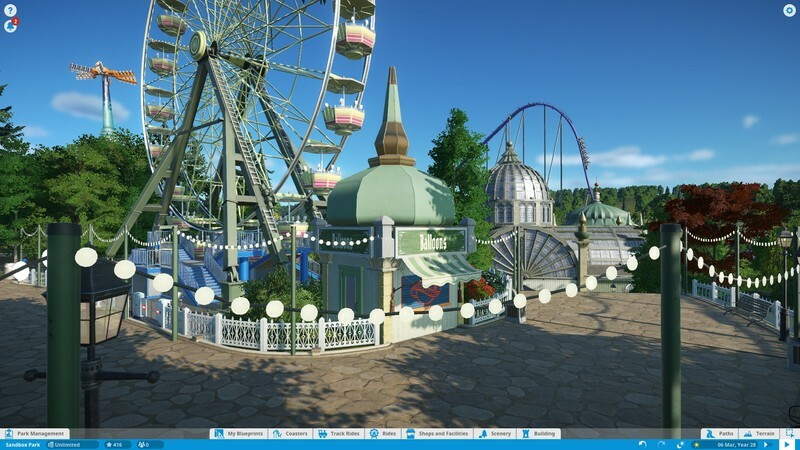 Working with this sort of theme is a bit daunting in Planet coaster as it has been carried off so well by others. 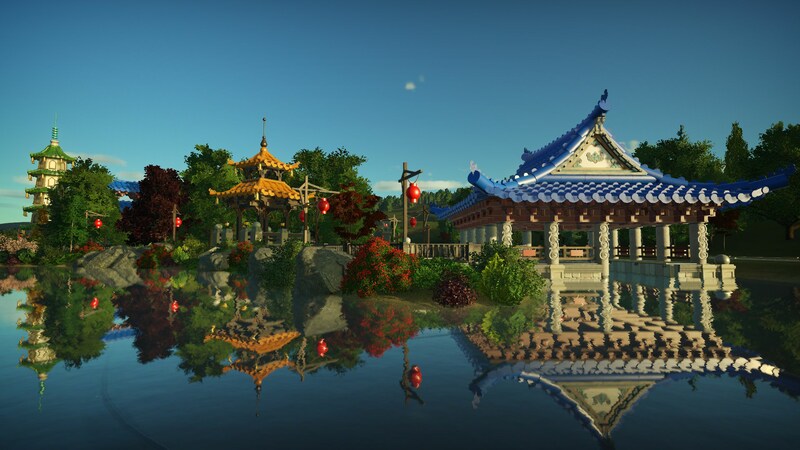 However, one aspect of this building style that I have never seen re-created in PC is the beautiful, colourful ceramic tile roofs that many traditional south-east Asian buildings have. I found that with the art shape cylinders, it was possible to re-create this quite effectively. As they have quite a shiny texture, they catch the light much like real ceramic would. Overall, I'm very pleased with how this area turned out. 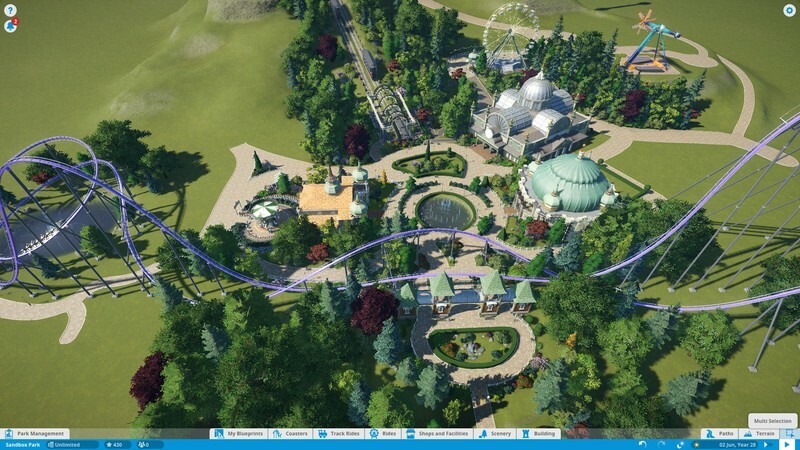 I currently plan to expand the area to include the last of the park's major coasters. 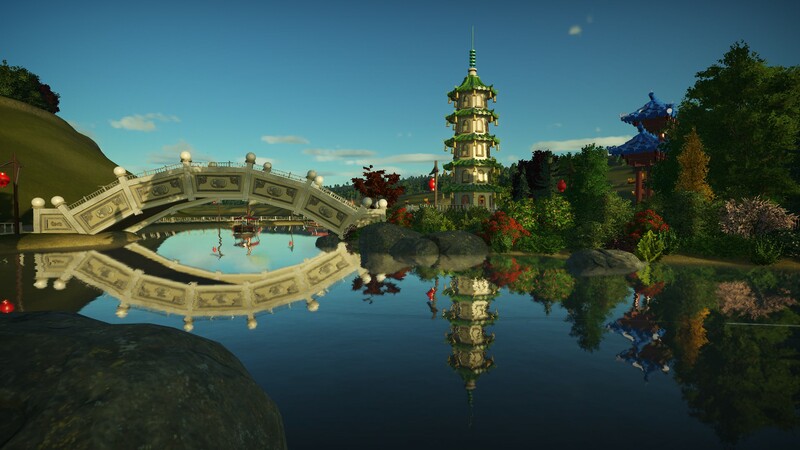 An overview of Pagoda Island. 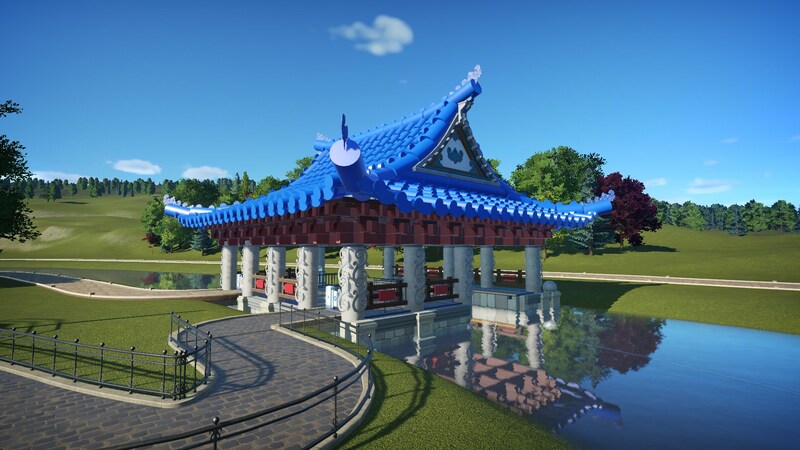 The main focus of the area is a 5-tiered octagonal pagoda. This was my first attempt at creating the tiled roof effect using the art shapes. 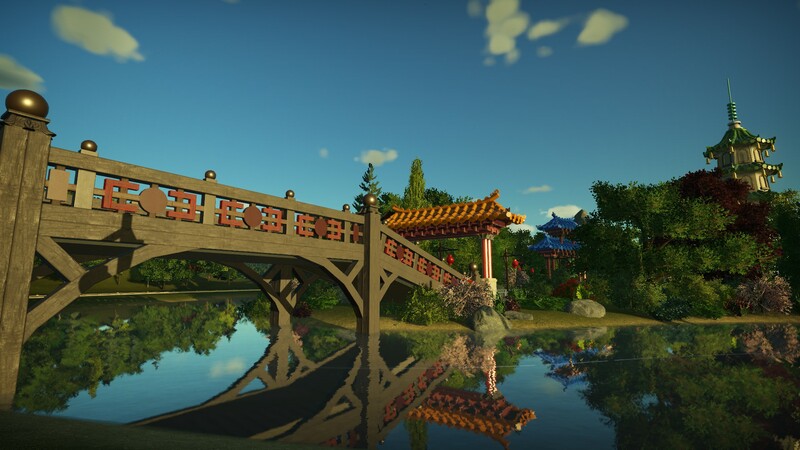 A view of the pagoda and the arch bridge that allows guests access to the island. 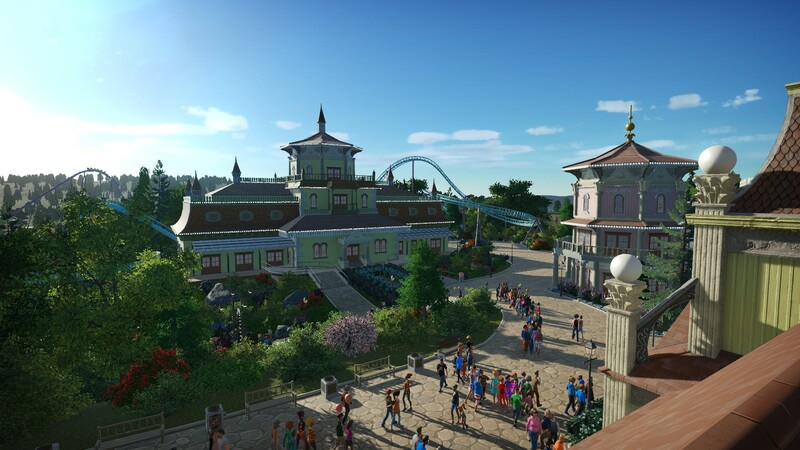 Expanding the park meant that new viewpoints were introduced to guests. The back of the Scenic Railway is now visible. 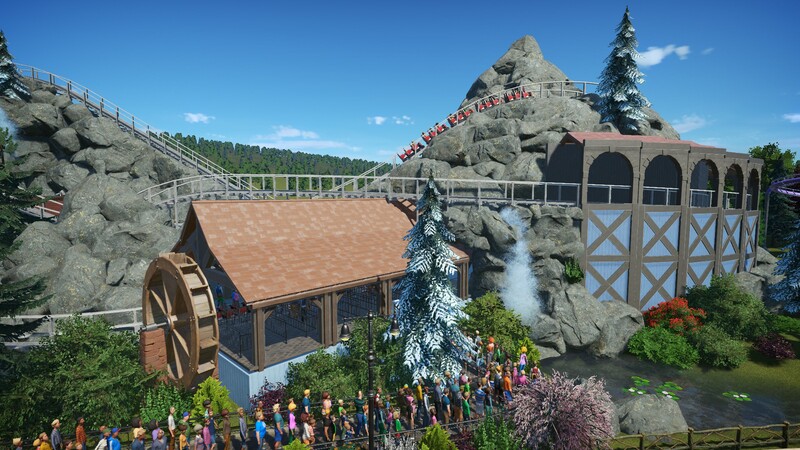 This required more rock work to be added and provided an opportunity to include a new scene to the ride in the form of a small cabin. 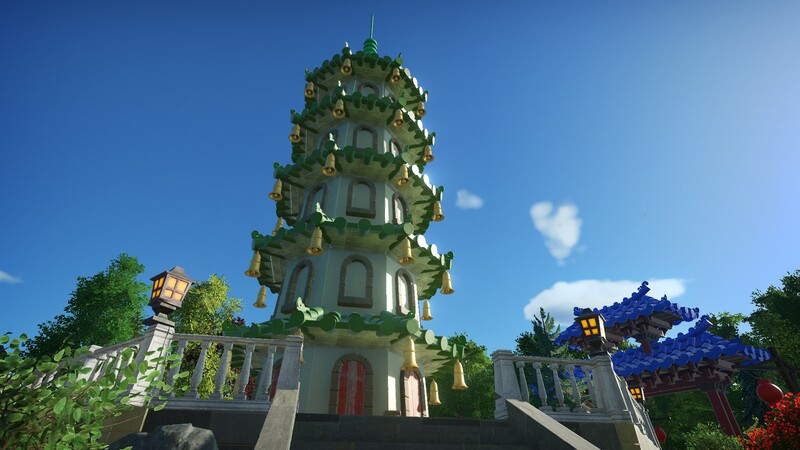 Another view of the Pagoda with the Scenic Railway in the background. The second of the two bridges onto the island. 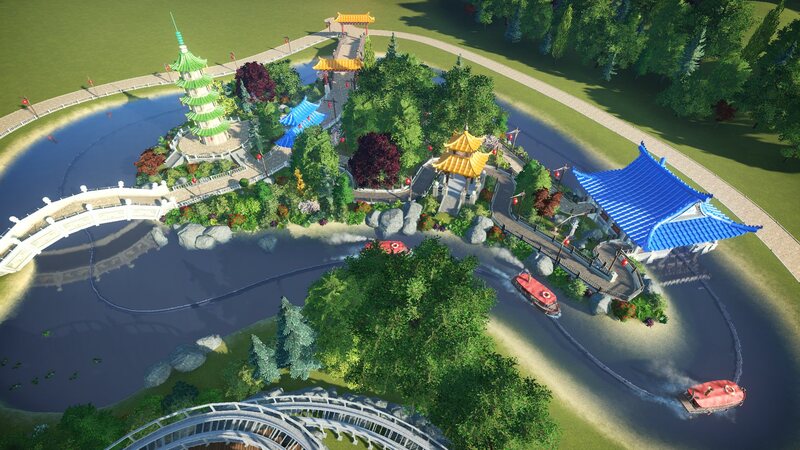 This is the station for the boat ride that circles the Island, pictured here before I added foliage and scenery. 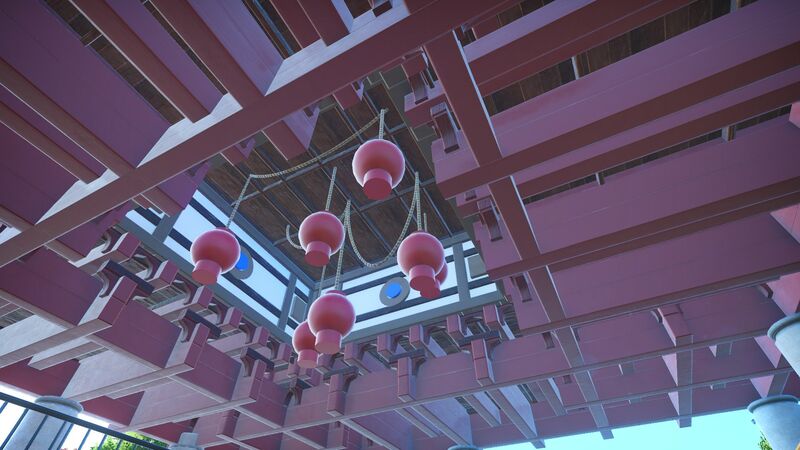 Lanterns and roof detail inside the station. Another view of the various buildings across the water. 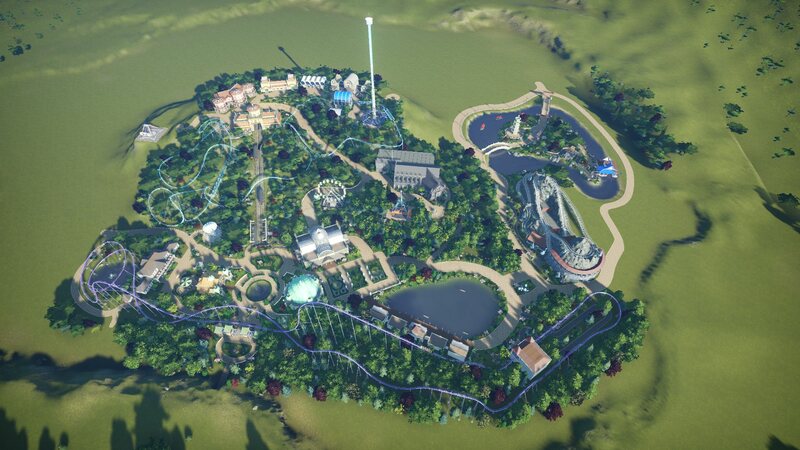 Finally, an overview of the whole park showing where the new area fits in. Thank you for reading and thanks for all of your kind comments in previous updates. I hope you enjoyed this update. Beautiful work, CGM! Those roofs really did turn out great. And those bridges are excellent, too. I particularly like the 2nd one with the nifty open railing. WOW! Love those roofs. Never thought to use art shapes for them before. 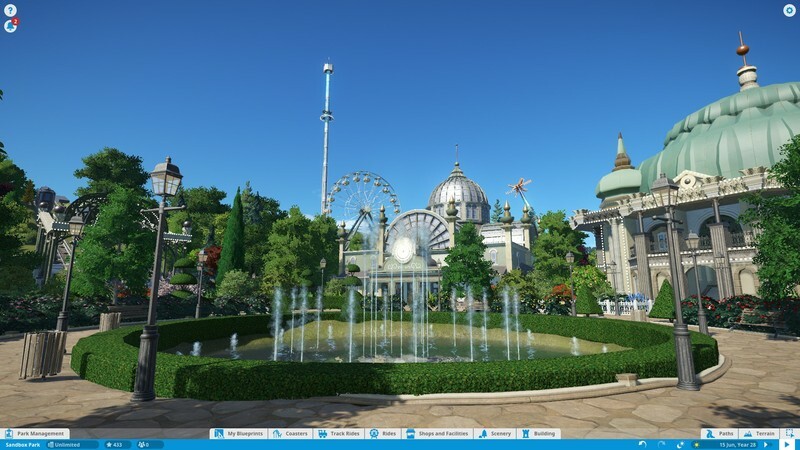 Looks great, and very themepark-esque. Looking for stuff? 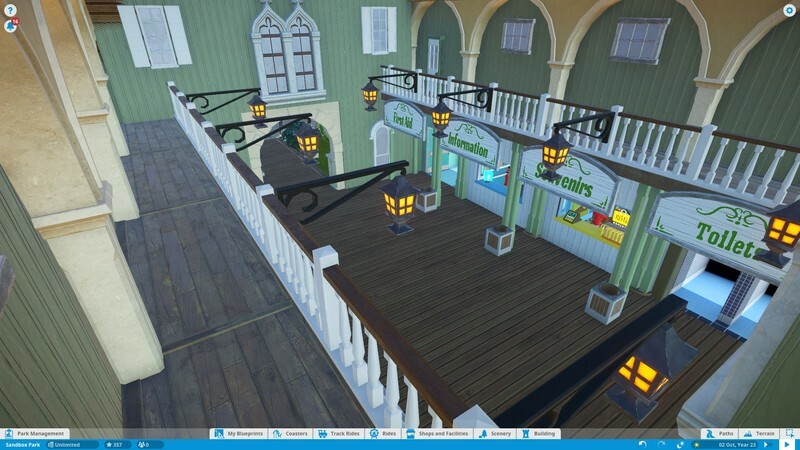 Visit my Steam Workshop! Page created in 0.228 seconds with 29 queries.